Whilst I had a great sail, the old Rogue did sustain some damage. About a 100NM out from arrival at Port Taranaki we were motoring during a quiet spell of minimal breeze when the engine coughed and cut out. Filters were clear since I knew the exact fuel that had gone in that tank since its repair in 2010. My fuel gauge is down below and it indicated I had about 20 litres remaining.....well maybe the gauge was broken so I added a jerry can and she started up quickly. Along we motored for another 2-3 mins and repeat. Starts up, runs for a minute shuts down.....what the?? The tank is located under the aft berth, so up with the base covers and ear to the tank........yep, I could hear the baffle sliding across inside the tank with every wave movement. Fuel pickups are normally off the bottom of the tank so in my case the rocking of the boat was allowing the baffle to float and get sucked up against the pickup starving the engine and shutting it down. A quick jury rig of a jerry can was enough to get me to port. Fortunately the main tank was near empty as the jerry tanks emptied quicker than expected since I had not jury rigged the fuel return line. After clearing Customs, Quarantine and Immigration Harley and his daughter had me secured on a commercial mooring big enough for the Queen Mary! No dragging here my friends! Time to open the old Rogue up for a dryout session. Time was precious as I had to fly back to Australia for work. I knuckled in and ripped the tank out with the intention of a new build. I had already had this tank out in Southport after it cracked on my way back from Malaysia. Harley kindly ran me around New Plymouth and after a few recommendations found a Engineering firm capable of duplicating the tank out of stainless, but thicker and with a better baffle system and 12v fuel gauge. Expensive?.....you bet.......worth it..you bet! 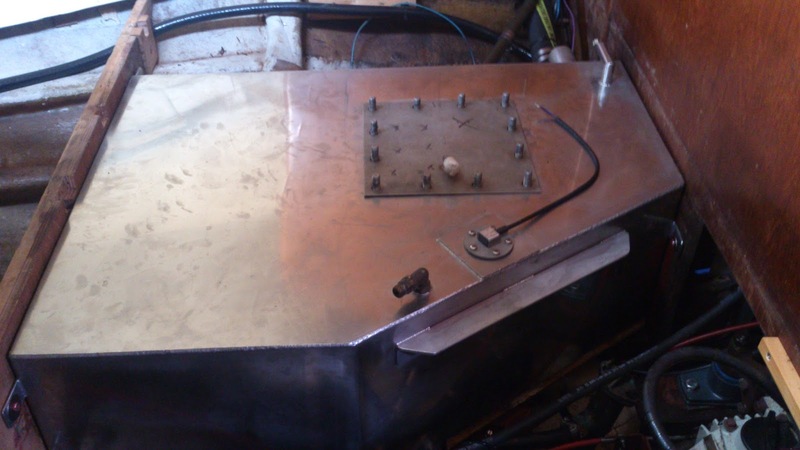 When I stripped the components off the tank and pulled the fuel pickup, I found it had been cut parallel with the tank base. If it had been built correctly, the pickup tube would have been angle cut and the fuel starvation problem would not have happened. Harley completed the CAT1 safety inspection and required paperwork and then I flew out to Australia, tired but happy the tank construction was sorted. Upon my return to NZ in April, Harley again came to my aide and picked up the tank so it was ready to go when I arrived. We gathered a few locals, commandeered a larger fishing tinny and we manhandled this odd shaped tank into the belly of 'Rogue Wave'. Only two people can fit for the final drop in and thankfully it slipped in exactly as planned. From there on in it was all go and we were back in action. The remaining jobs were minor and included the placement of all my Soldier On, media tags and race number. It was several days before the weather gods smiled enough for me to stay in the dinghy whilst I attached the decals........crooked adds character they said ! She drew many compliments and support for Soldier On.